An outdoor kitchen can provide you with a great way to entertain while enjoying the great weather, and can also increase your living/entertaining space. As this article notes, outdoor kitchens are especially popular in warm weather regions because they can be used nearly all year round (at least, once the temps drop a bit in the evening). There are a few important considerations you need to think about when planning an outdoor kitchen. First, of course, your available space will determine (and possibly limit) your options. And your budget will also be a major factor. Outdoor kitchen elements tend to be more expensive than their indoor counterparts because the outdoor versions must be able to withstand the elements and endure much more demanding conditions than those that will live a sheltered life indoors. Next, you must take your lifestyle and preferences into account. Just as with your indoor kitchen, your needs and entertaining/cooking habits will dictate a lot of your choices and determine which items are a higher priority for you. If you generally host more casual, family-style gatherings, then barbecue equipment and picnic areas may be the best fit for you. On the other hand, serious chefs who host more formal gatherings may need gourmet-level amenities. Design elements also need to be considered. You’ll want the style to match not only your tastes but also to complement the rest of your landscaping and other exterior elements. 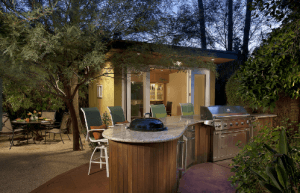 Whatever vision you have in mind for your Arizona outdoor kitchen, RW Remodeling can make it happen.